Month 2 Muscle & Fitness Male Model Online Contest Winners! Congratulations to Erik De La Rosa and Riste Vodjanski! Both will now compete in the Muscle & Fitness Male Model Online Contest, to be held during the 2012 Olympia Weekend in Las Vegas, where they'll vie for an exclusive photoshoot with Muscle & Fitness magazine! Well done, guys! For those who just missed making Month 2's winner's circle, you can still enter Month 3's competition, as can anyone who meets the contest's rules. We'll be taking submissions through July 21, so make sure to get us your pictures ASAP! 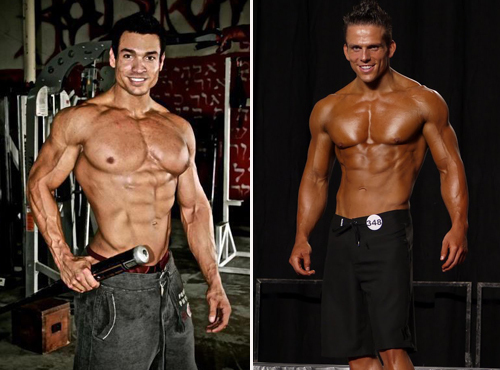 Again, congrats to Erik and Riste on being Month 2's winners in the Muscle & Fitness Male Model Online Contest Contest! Click here for our Q&A with Erik. Click here for our Q&A with Riste.